The DM-2050iDX produces a full 2,000mW at 808nm making it twice as powerful as the nearest competitor. A convenient thumb switch activates the high-intensity pulses for the rapid destruction of hair follicle tissues. 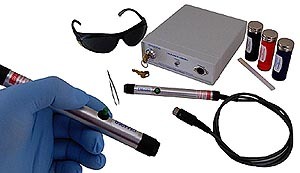 Laser module (32 Jmm2 808nm pinpoint beam), 1 laser power supply, 1 quantity of laser protection eyewear, 25ml carbon dye gel, 25ml of 2% lidocaine pre-treatment gel, 25ml of anti-androgen post treatment gel, tweezers and instructions. This system is perfect for hair by hair or detail work. Australian Dollar 329.95 (includes VAT) Article ships from USA. Laser output is delivered by a convenient thumb switch on the comfortable brushed aluminum module. The emission zone treatment area is a highly precise pinpoint beam, which is perfect for hair-by-hair epilation. Laser light with the wavelength of 600 to 900 nm (nanometer) passes through human tissue with very little loss of intensity. 1 mm Beam (pinpoint), Power: 32 Jmm2/second max fluence, Laser Type: CW Diode. Time for Dense Moustache Treatment: 30 minutes.